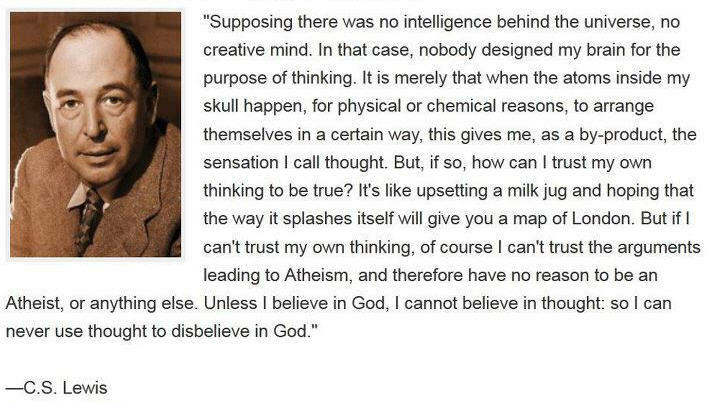 I like some of Lewis' fiction, but his philosophy I've always found lacking, even when I was a Christian. How can he trust his brain to believe in God? Curious that he would choose such circular reasoning. Deism begins with a positive - Divine intelligence exists and created human intelligence. Athism begins with a negative - Divine intelligence does not exist and any human intelligence is a result randomness not intelligence. In my thinking the issue is a rational faith in that divine intelligence. If one does not begin there then they have to build on a negative foundation that is ultimately circular in nature because they do not have a point to begin with. Is the absence of something a negative? There would be no atheism without deism. Before I had heard of the supposed existence of Sasquatches I didn't believe in them, I wasn't stating positively or negatively whether they existed. It seems to me his argument goes: God exists and created me and my brain, allowing me to think. Because I can think and trust my own thinking, God exists. Perhaps I am misinterpreting his words. For the record, I do not have a position on the Big Foot. It is not really circular to conclude a conclusion that contradicts my starting point is false. If I start with the idea I thinking and reach a conclusion by thinking that I cannot think, either my conclusion is wrong (and there is something wrong with my reasoning in getting there)or my original idea that I can think is wrong so I cannot start reasoning at all.